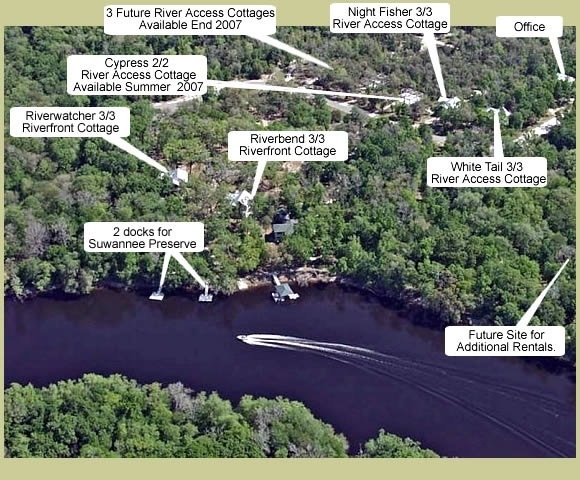 2 riverfront, 3 river access cottages on Suwannee River in Gilchrist County, Florida, to be sold at public auction. Two riverfront and three river access cottages on the Suwannee River will hit the auction block on Saturday, December 1, at 11a.m., according to John Hill of J.W. Hill and Associates. "These are fully furnished, income producing properties with good rental history," said Hill. "These properties are part of The Cottages at Suwannee Preserve, set among 22 acres of woodlands along the pristine banks of the historic Suwannee River." Located just 45 minutes Northwest of Gainesville, the homes feature 3 bedroom, 3 bath and 2 bedroom, 2 bath floor plans. "One of the cottages will be sold absolute to the highest bidder regardless of price," said Hill. The cottages are designed and built under the current and stringent 2002 building code and conform to all FEMA and Suwannee River Management District regulations. They have underground electric and telephone lines, as well as private wells with state-of-the-art water treatment systems. Each cottage has maintenance-free exterior vinyl siding and aluminum handrails, along with durable and attractive tin roofs. The piling construction creates a large covered parking area under each cottage for protection of autos, watercraft, golf carts and more. The interiors of the cottages feature crown molding and five-inch baseboards with nine-foot ceilings throughout. There are tile floors in the living areas, kitchens and all baths. Each cottage has General Electric appliances, Hunter Douglas window treatments, central heat and air, ceiling fans in every room and Dish Network satellite systems. The exteriors of the cottages feature two porches - one screened for bug-free dining and the other an open sundeck - as well as fire pits and porch swings. The homes may be previewed during an open house on Wednesday, November 28, from 11a.m. to 3p.m. Private viewing may also be arranged by appointment. For more information, contact John Hill at 888-828-8894 or visit http://www.jwhillauctions.com. Amenities already in place at The Cottages of Suwannee Preserve include: floating docks, boat ramp, basketball court, volleyball court, tether ball, horseshoe pit, shuffleboard, children's playground, wildlife feeders, common picnic area by the river, fish cleaning sink, seven-station fitness trail, and nature walking trail. According to the website for The Cottages of Suwannee Preserve, the idea of the cottages on the Suwannee River was developed by Kennedy Construction Founder Rick Kennedy and a group of friends, who joined together to form the Suwannee Preserve LLC. Kennedy Construction (CBC058849) is a premier home builder and family owned business based in Sanibel Florida since 1980. Kennedy and friends discovered the Suwannee River in 1998. They were impressed with the friendliness of the people and the peace and beauty of the area. Together they decided to buy riverfront property and completed a four bedroom, four bath home - Suwannee House - that they've continued to use for family vacations and weekend getaways. The group decided it would be a good idea to rent the cottage when not in use and soon discovered there was a high rental demand. The demand for their riverfront cottage soon led to the birth of The Cottages of Suwannee Preserve. The Cottages are centrally located on Florida's Nature Coast, situated on 22 acres of property in a park-like setting with riverfront access. Cottagers can enjoy all that the Suwannee River, area springs and pristine countryside have to offer with such activities as fishing, scuba diving, snorkeling, swimming, tubing, hiking, bird watching, bicycling, clay shooting and horseback riding. There are also plenty of antique shops nearby. The area has the highest concentration of freshwater springs on earth, with two major rivers forming the northern and western boundaries of Gilchrist County, and over 60 springs within or contiguous to the country. Published by ASMarketingCenter.com a division of http://www.auctionservices.com and the http://www.nationalauctionlist.com. J.W. Hill & Associates, Inc.